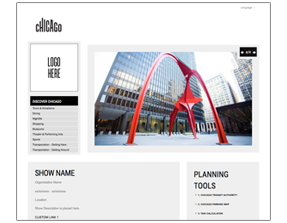 Introduce your attendees to all the great things Chicago has to offer with a custom microsite. To get started, fill out the form below, and we&apos;ll setup a custom microsite for your event and send you a dedicated link within the next 5-8 business days. For questions with this form or an existing microsite, please contact us here. We recommend using the name of your show or organization as your microsite name. This name is only used internally and not displayed on your microsite. "The word or acronym provided will be used to develop your microsite home page URL. Example: http://www.choosechicago.com/[url extension]"
Choose Chicago provides imagery below for your microsite or you can upload your own. For optimal display, please upload an image that is 660 x 386 pixels. If you are unable to do this, then upload a horizontal image that is at least 660 x 386 pixels in size (or 6 x 4 inches). Please note that if you upload an image that is smaller or larger than 660 x 386 pixels some stretching or cropping will occur. Files must be in .jpg or .gif format. Add up to 5 custom links to provide more information and resources for your show attendees. These links will appear below your Show Information and Description. We recommend cross-promoting important meeting information from your website. For example: Home Page, Registration, Housing, Exhibitor, List, Guest Speakers, Educational Programs, etc.